Call it extra motivation. Call it an added incentive. Call it a chip on her shoulder. However you label it, it’s clear there’s something that drives Kristina Peszel. 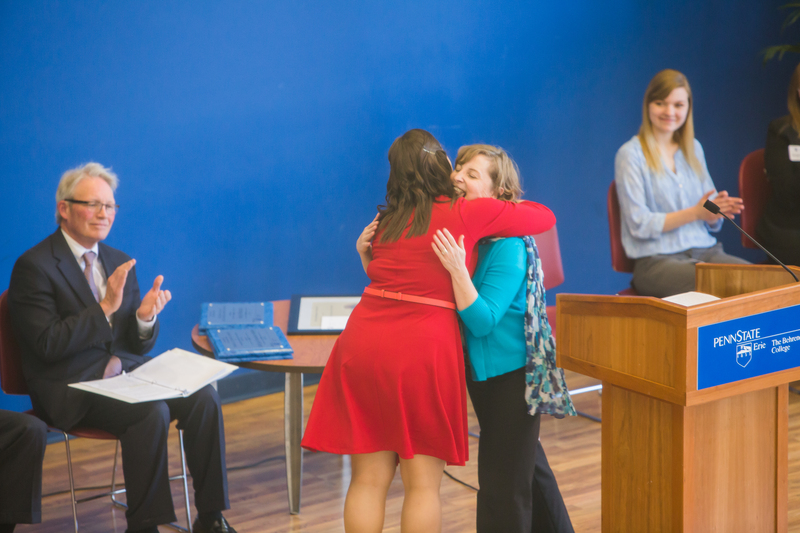 In her time at the college, Peszel has been a standout student, as evidenced by the Eric A. and Josephine S. Walker Award she won at this year’s Honors and Awards Convocation on April 27. The award recognizes a student whose outstanding qualities of character, scholarship, leadership, and citizenship have been directed into student programs and services. Peszel was thrilled to have been chosen for the award. 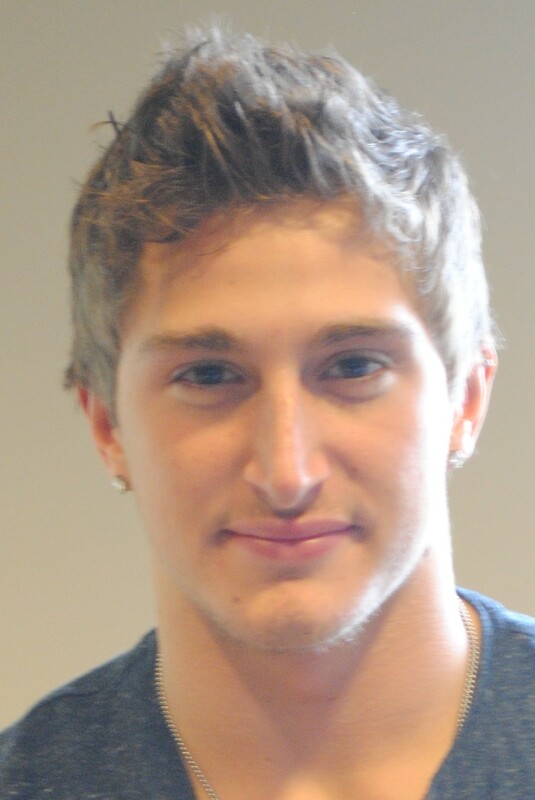 “It was really exciting, and it felt like recognition of everything that I’ve done on campus,” Peszel says. It was a much deserved honor. 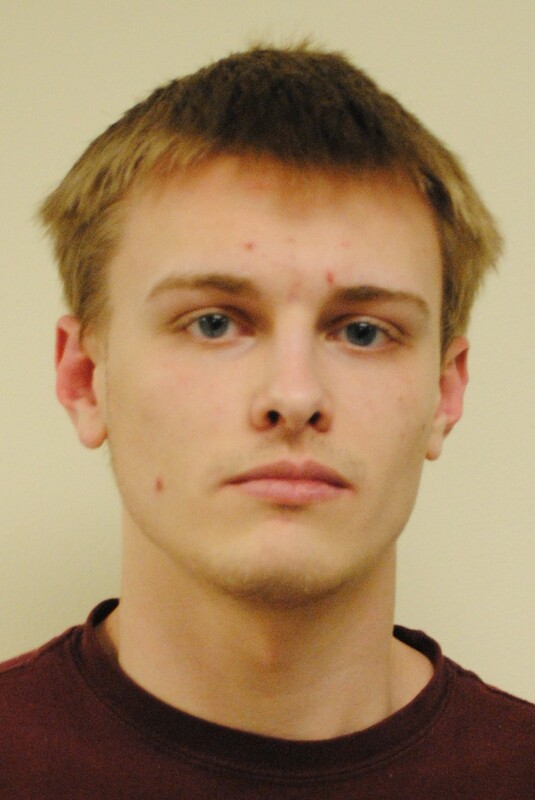 The Erie native has a 3.96 GPA and is the lead writing tutor at the Learning Resource Center. She’s served as the vice president and secretary for both the Alpha Sigma Tau sorority and Omicron Delta Kappa, the national leadership honor society. She’s also been a member of the Lion Entertainment Board, Reality Check, Studio Theatre, and a contributing writer for the Behrend Beacon. 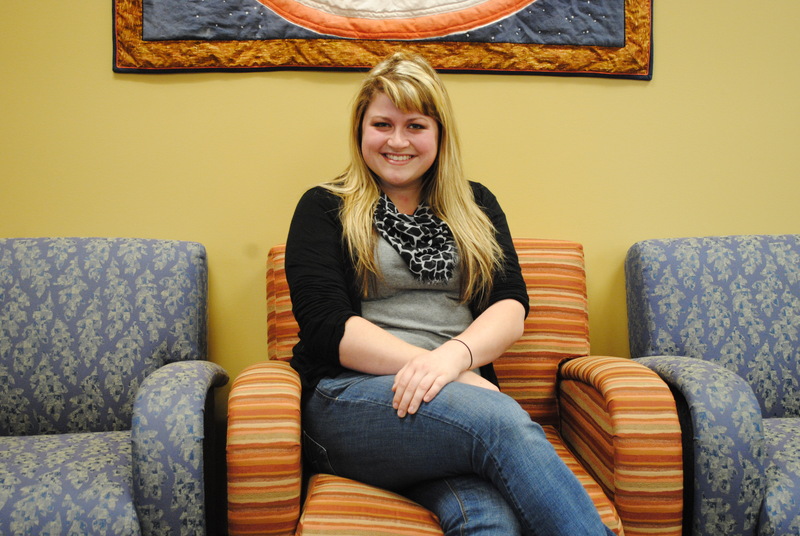 Through her campus involvement, Peszel learned that she prefers to be busy. She thrives on activity, one reason she believes she’s been successful. “If I have enough time to watch television, I feel as if I’ve forgotten something,” says Peszel, who will graduate in December. Things have not slowed down this summer for Peszel, who is interning at Erie Insurance in the company’s IT department. 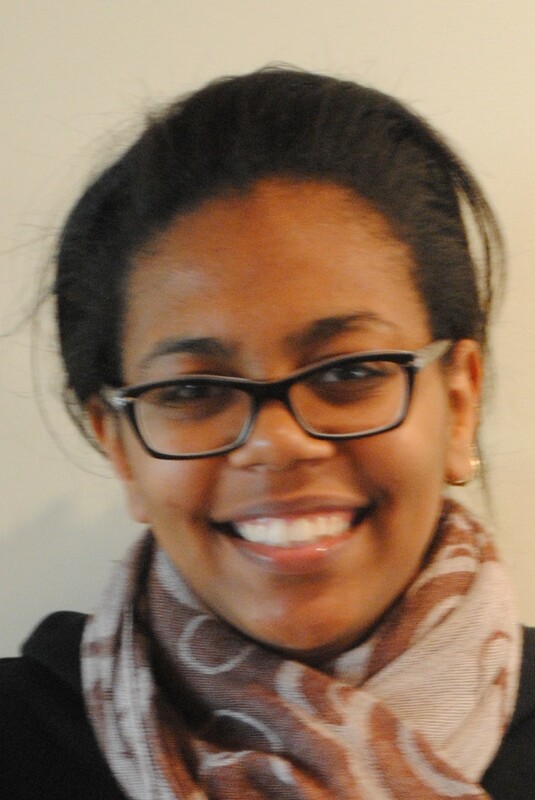 The work she is doing relates directly to her experiences as lead writing tutor in the Learning Resource Center. As a tutor, Peszel often edited various engineering papers, which provided her with skills and experience in technical writing. It has led her to think of her future in a different light. “I realized that I’m not just a humanities student, but I can do the technology thing too,” Peszel says. Ruth Pflueger, director of the Learning Resource Center, has worked with Peszel for the past three years at Penn State Behrend. 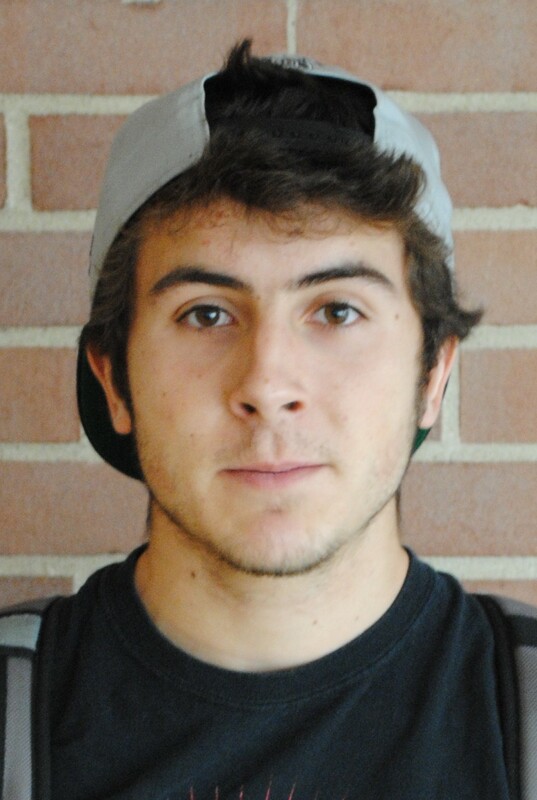 With one semester left until graduation, Peszel plans to make some great memories and leave a legacy. Meilyng Gonzalez-Adams had been planning for days, and her personal sales pitch was ready. The senior International Business and Accounting major knew 149 companies would be in attendance at the spring Career and Internship Fair at Penn State Erie, The Behrend College, and she was ready to make an impression. But life is full of surprises. On March 19, just one day before the career fair, Gonzalez-Adams was invited to an impromptu interview with representatives from PricewaterhouseCoopers’ office in Cleveland. It didn’t take long for the Guaynabo, Puerto Rico, native to cancel her plans for the next day. “PricewaterhouseCoopers called me that evening, and I called my mom and said, ‘I got a job offer, and I am not going to the career fair tomorrow,’” recalls Gonzalez-Adams, who will start her job as a tax associate with PricewaterhouseCoopers, one of the world’s Big Four audit firms, in September. The job offer from PricewaterhouseCoopers was the culmination of four successful years for Gonzalez-Adams, this year’s recipient of the Thomas H. Turnbull Award. 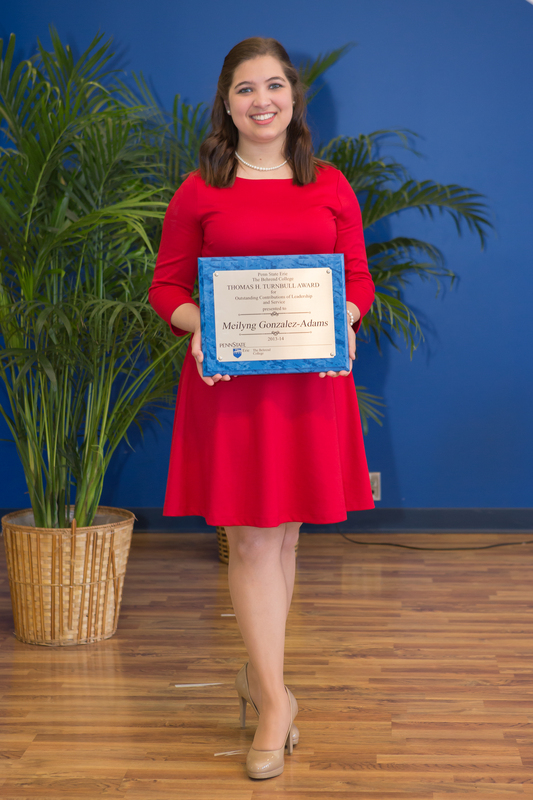 The award, which recognizes a Penn State Behrend student who has contributed to the college community through outstanding qualities of character, scholarship, leadership, and citizenship, was presented to Gonzalez-Adams at the sixty-fifth annual Honors and Awards Convocation on April 27. The award’s description fits Gonzalez-Adams. 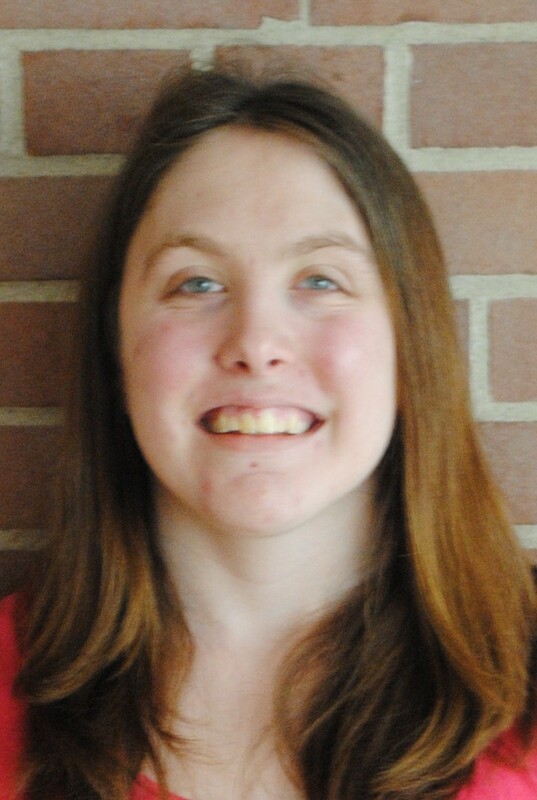 She was active during her time at Penn State Behrend as she graduated with a 3.79 GPA and served as a resident assistant and treasurer for the Alpha Sigma Tau sorority. She was a member of Penn State Behrend’s Lion Scouts, Omicron Delta Kappa, the national leadership honor society, the Honor Society of Phi Kappa Phi, and Beta Gamma Sigma, the national honor society in business. Gonzalez-Adams credits her parents, Evan Gonzalez and Olga Adams, for much of her success. The two were young when Gonzalez-Adams was born, but they both attained college degrees. The drive displayed by her parents resonated with Gonzalez-Adams and motivated her to get involved from the moment she arrived at Behrend. She says she had some helpful guidance along the way though. The feeling seems to be mutual. “Meilyng is an extraordinary individual and has made a lasting impression on me, the admissions staff, our visitors, and the campus,” says Andrea Konkol, associate director of admissions. According to Konkol, the college has extended its recruiting efforts to Puerto Rico, and Gonzalez-Adams has been vital in making students feel welcome. Gonzalez-Adams says she enjoys helping. She recognizes the growth she’s made at Penn State Behrend, and she hopes others can have a similar experience. What does 7,219 pounds look like? Imagine two hippopotamuses, fourteen gorillas, or two cars, and you’ll have an accurate picture of the amount of electronics collected May 8 at the first Electronic Recycling Event at Penn State Erie, The Behrend College. 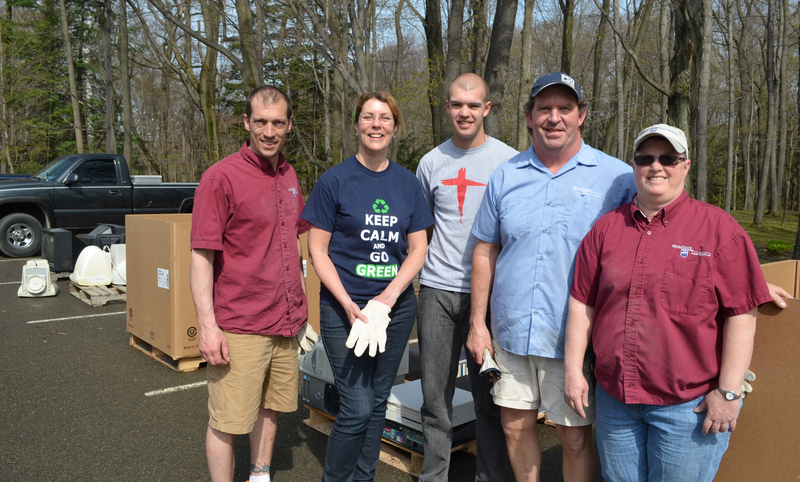 The event, co-sponsored by the Greener Behrend Task Force and Lion Surplus, allowed Penn State Behrend faculty members, staff, and students an opportunity to dispose of used electronics in an environmentally friendly way. Television sets, monitors, hard drives, printers, and DVD players were among some of the most collected items. The 7,219 pounds filled ten pallets. From Erie, the items will be taken to the Lion Surplus facility at University Park to be sorted and sent out to various recycling vendors. Ann Quinn, faculty adviser for the Greener Behrend Task Force, said she was impressed with the turnout for the event, and she would like to see it return in the future. 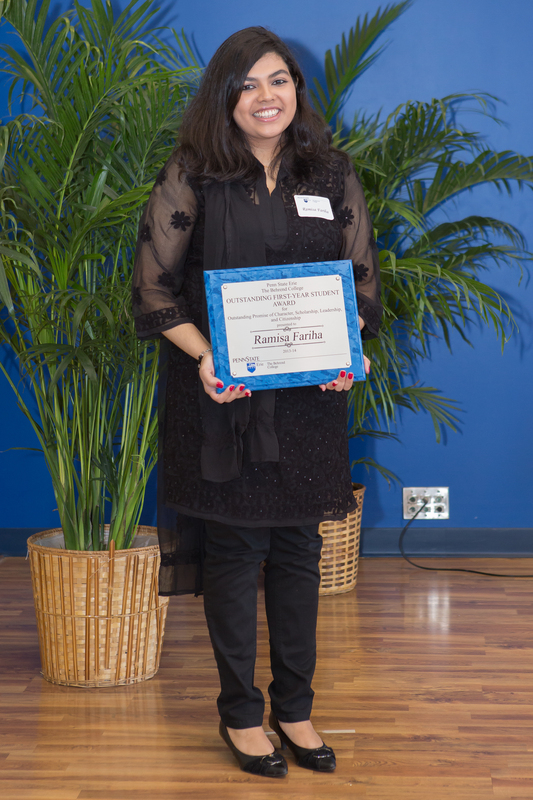 Bangladesh women do not typically come to America to pursue a college education, but there’s nothing typical about Ramisa Fariha, this year’s recipient of the Outstanding First-Year Student Award. For starters, the Narayanganj, Bangladesh, native, who recently completed her first year as a Biomedical Engineering student at Penn State Erie, The Behrend College, is a diehard professional wrestling fan. She draws inspiration from her favorite World Wrestling Entertainment wrestler, Batista. As a child, Fariha would watch wrestling with her brother, Sajjadul Karim Chowdhury. They both had their share of favorite wrestlers, but there was something about Batista that resonated with Fariha. But it’s more than just an inspirational catchphrase for Fariha. It’s a guiding philosophy that she has taken to heart. Fariha has a lofty goal. 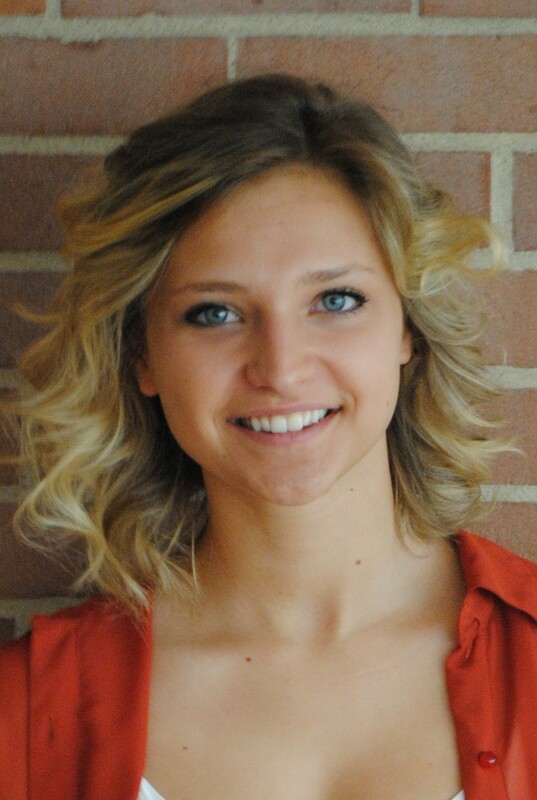 While she knows her aim is high, she’s confident that hard work will get her there, and she’s wasted no time at Penn State Behrend, swinging for the fences in her very first year. 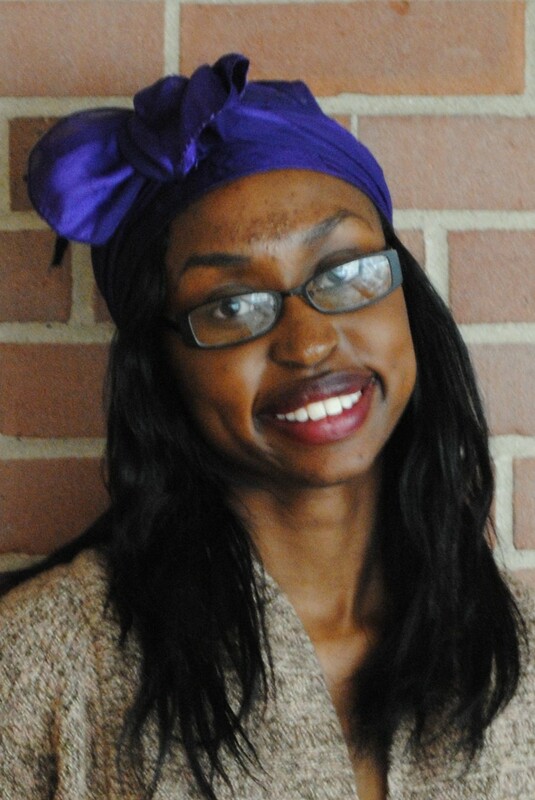 Not only does she have a 3.82 GPA, but she is a member of the Lion Entertainment Board, event correspondent for The Behrend Beacon, Residence Life Service Leader for Center of Service, a member of the Lambda Sigma national honor society and the 2014-2015 elected president for the Muslim Student Association. 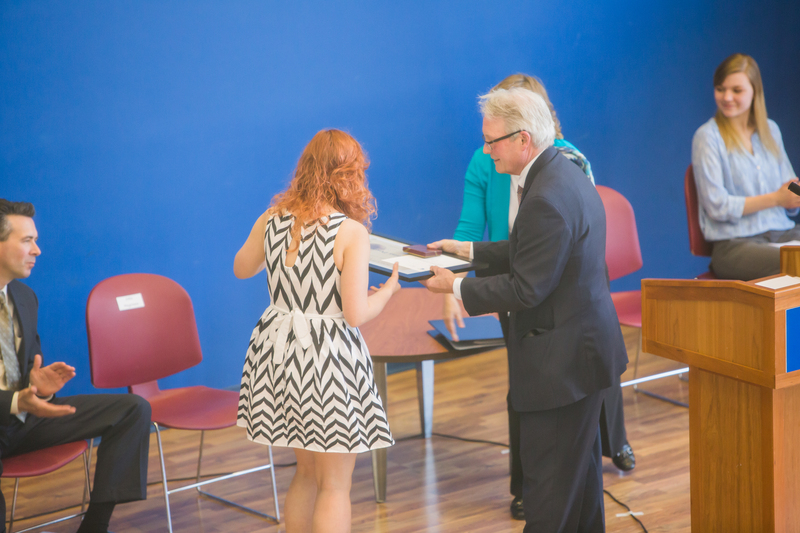 Fariha says she thought of Batista often during her studies and even rewarded herself with a silver Batista pendant after winning the Outstanding First-Year Student Award at the sixty-fifth annual Honors and Awards Convocation on April 27. 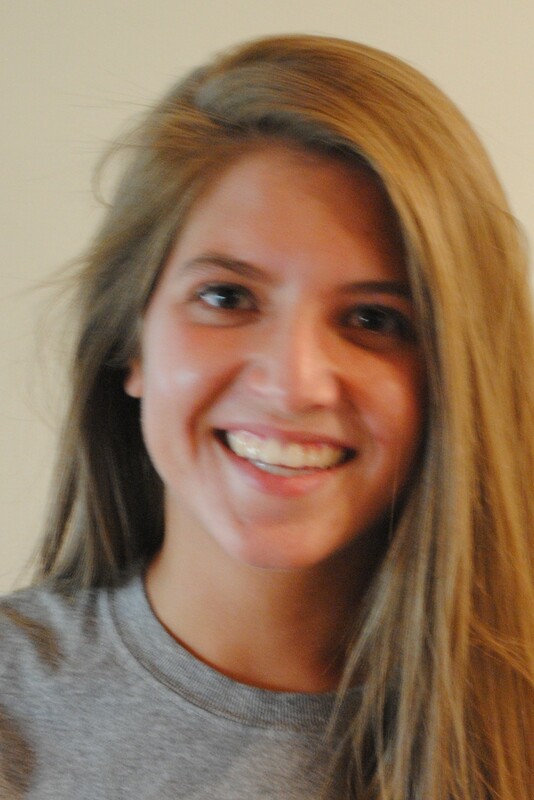 She says she also attributes some of her success at Penn State Behrend to the warm welcome she has received. She describes Dr. Mary-Ellen Madigan, director of enrollment management, as a “second mother,” and says her professors and friends have also made her feel at home. Fariha says winning the award, which recognizes a first-year student who demonstrates outstanding promise of character, scholarship, leadership, and citizenship through achievements in his or her first year of study, was a moment she will never forget. Fariha says the award made her family very proud. Her father, Ahsanul Karim Chowdhury, is one of the top lawyers in Bangladesh and has always emphasized education. Fariha’s mother, Laila Nahar Chowdury, taught her to work hard and to not take anything for granted. Her brother, Sajjadul Karim Chowdhury, has encouraged her at every step along the way. “This award shows that I’m here to do something special,” Fariha says. Fariha says she is excited to return to Narayanganj this summer, so she can watch wrestling with her nieces and start a new generation of fans. She knows some people say professional wrestling is fake, but she doesn’t care. “If you start to rationalize everything, you lose the fun in life,” Fariha said. Fariha hopes that more students from Bangladesh will consider coming to Penn State Behrend in the future. From the moment she started to look at colleges, Fariha said Behrend just felt like home, and she believes other Bangladesh natives could have a similar experience. Her best advice to new students? On a rainy Tuesday evening in late April, twenty-five Penn State Behrend students gathered at Nunzi’s Place to test techniques they had learned in CAS 100 Effective Speech. They dressed up for the occasion. The women wore dresses and cardigans. The men wore business casual attire. A few even wore ties. They sat at banquet tables arranged in a horseshoe formation around a podium. To the left, at a small table discretely tucked in the corner, Dr. Miriam McMullen-Pastrick, lecturer in speech communication, took notes. But, pressure is sort of the point at the Toasters’ Banquet—an end-of-class tradition for students in McMullen-Pastrick’s classes. Each class organizes their own banquet, collecting money from classmates for dinner, creating and printing programs, and voting on which classmates should receive awards — some serious and some not-so-serious. 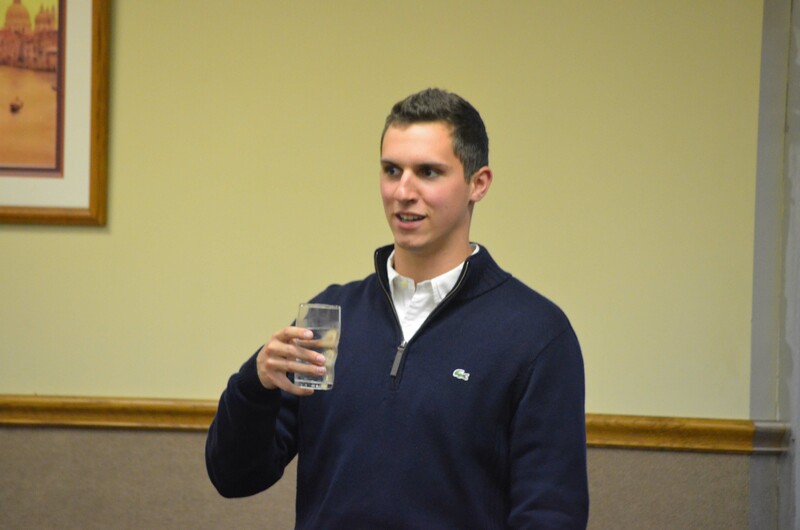 On that rainy Tuesday that Section 005 had their banquet, Andy Peterson, a junior Physics major, gave opening remarks. Brian Ristau, a freshman Engineering major, introduced Jacob Roth, a sophomore Earth and Mineral Science major, who gave an informative speech. Zach Reese, a junior Mechanical Engineering major offered a toast. And, so it went, with all twenty-five students taking at least one turn at the podium, offering a variety of entertaining, informative, and persuasive speeches, debates, toasts, and introductions until Guiliana Latella, a sophomore Nursing student, gave the closing remarks. Between all the speeches and presentations, they enjoyed a small feast—pizza, pasta, meatballs, antipasto, and dessert—during which they were encouraged by McMullen-Pastrick to work on their dinner conversation skills. Throughout the evening, the students laughed, joked, and listened attentively to one another. But, as McMullen-Pastrick might remind you, part of being a good speaker is being a respectful and intense listener. “They learn by listening to each other with focus and purpose,” she said. 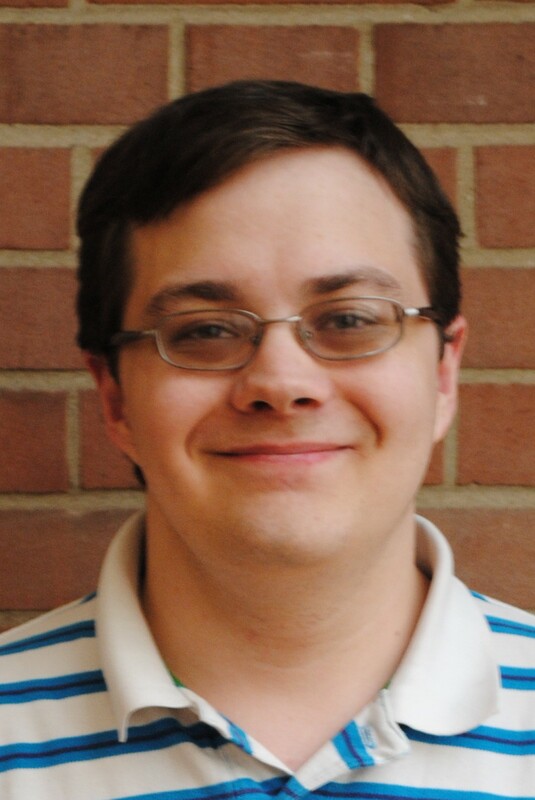 McMullen-Pastrick typically teaches three sections of CAS 100 each semester and attends a banquet for each. 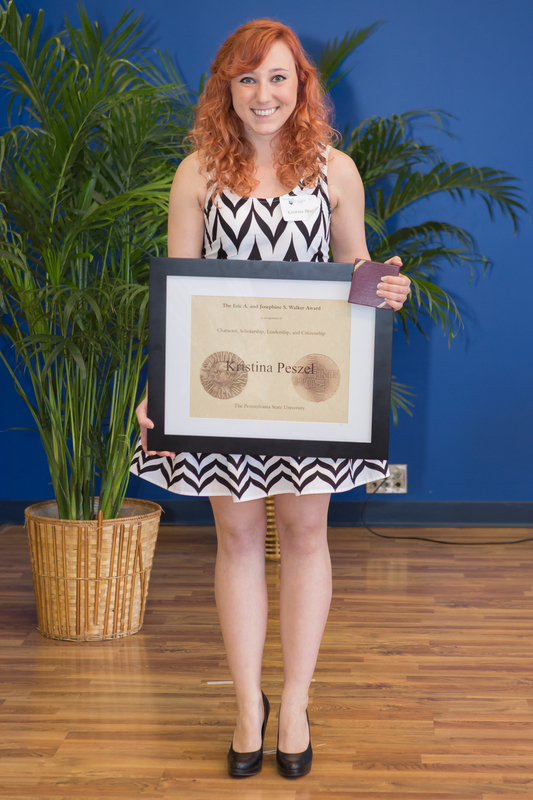 In the Spring 2014 semester, she attended her 175th banquet. Behrend Reacts: How do you stay motivated for final exams? Final exams are often one of the most trying times of the entire semester, and it can be difficult to push through. With just two days of final exams left, we asked students how they stay motivated through the home stretch. Tara Sitter does not plan on becoming an entrepreneur after graduation, but she has a great first product if she ever changes her mind. Sitter, a junior Accounting and Finance major, was recently a finalist in the Oh-Penn For Business College Business Plan Competition. 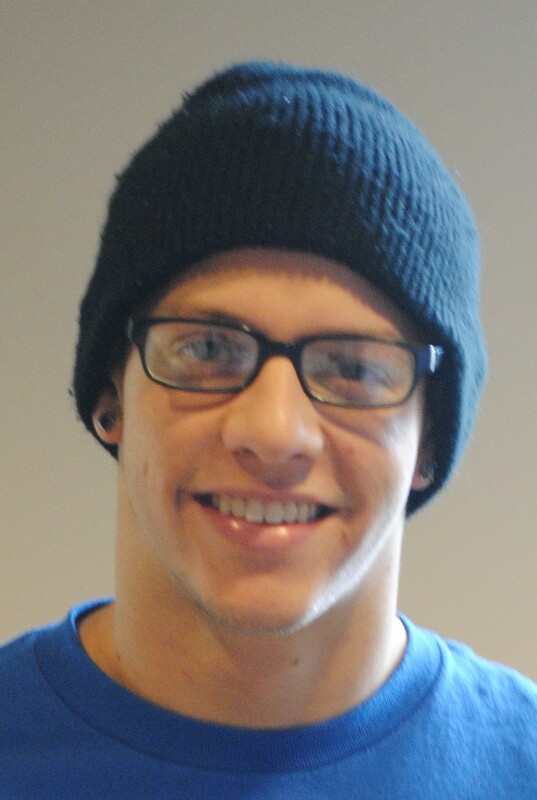 The competition was held April 12 at Grove City College. Participants were required to present a ten-minute PowerPoint presentation on their business idea. The Erie native’s business idea was the Bumper Box, a built-in toolbox that fits into the front bumper of a truck. She developed the concept with classmates in her FIN 451: Intermediate Financial Management class. The idea for the Bumper Box was inspired by the fact that many trucks are equipped with toolboxes in their truck beds, which takes up hauling space. There would be more room in the bed if a toolbox were instead installed toward the front of the truck. Sitter was confident in the idea, so she entered the Oh-Penn For Business College Business Plan Competition. After submitting her brief proposal, she was chosen as a semifinalist. Her next task was more labor intensive. “I literally had a week to put together a ten-page paper,” Sitter said. Fortunately, Sitter was able to simply revise and update a paper she had written for class. She was notified in the beginning of April that she was one of nine finalists. During the final competition, Sitter presented her Bumper Box idea to four judges and several Grove City College students. While Sitter did not end up placing in the competition, she said there were many other benefits that came from it. Many of the judges also offered helpful suggestions for improving the Bumper Box. Perhaps the door to a future career as an entrepreneur might not yet be shut. 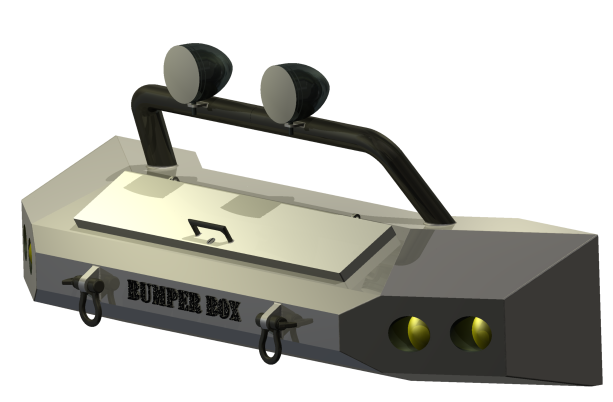 “I think if the opportunity presented itself, I would love to pursue manufacturing the Bumper Box,” Sitter said.